Hello! So, I'm a new violin player (I've owned one for all of two days, a Cremona SV 175), and this seems to be a fairly relaxed forum. Anyway, I've been playing guitar semi-seriously for about six years, mandolin for two, and one year of baritone in high school band, and figured I would move onto violin, which is frankly the most intimidating instrument I've played (and I had to learn to read bass clef for high school band, on top of learning to march in a show). I'm having a hard time of it right now, so unless all of my questions are already answered here already, you folks will be seeing me around here begging for help! Welcome to the forum, mr. knock. Yes, violin is a very intimidating thing. A lot of people think this is the instrument for them and after a few months of playing, they don't sound like, "David Garret", get discouraged and quit. It takes a long time and hours and hours of practice to play well. If possible take lesson's. Welcome to the group, errr... family of us fiddler players and beginners alike. I've been here for all of 3+ years, started here without any knowledge of violin playing and I have to tell you, it'll take the better portion of 6 months to a year before you'll say to yourself, yea. I can do this... so. Having a background already in fretted instruments can be a problem, since the mind thinks the accuracy of finger placement is not critical. I'm just now starting to learn guitar and I find it really quite simple to fret a note and play. The biggest problem I have is the massive distance between notes! You will find just the opposite to be true going from guitar to violin. Trust me. On the mando, you will find a few members here that play it as well. Even though the mando is tuned the same, the mando requires a lot more finger pressure because of the double strings and frets, so keep in mind a light touch is all that's necessary on a violin. Lots of things are the same but a lot of basic things are really different. If you devote at least 15-20 min a day to your violin and not a 2 hr cram session on a weekend, you'll progress very rapidly, daily practice even for short periods of time are far far more productive than one long day once a week. Stick with it and you'll be rewarded. After 3+ years I only have about 6-8 tunes that I play comparatively well, some have 2 dozen or more they can play maybe well enough that you would recognize the tune... that's not something I consider to be mastered...as they need a lot of hours to refine the tune and get control of the bow and thus the music. The type of music you choose to play has a big impact on how you learn as well. For now, bang out some lessons and see if you'll take to it, it's something that requires some dedication and time for sure. Yes, the violin is a challenge...but in a short time you will be making sweet little sounds and wonderful music. Look around and ask a lot of questions. Everyone here is so kind and so helpful. Hi knock, and welcome to the madness. I started violin a little less than 3 yrs ago. Guitar, I've played for coming up on 40 yrs. Your left hand will catch on pretty quick, and you will have some advantages like finger strength, dexterity, independent finger movement and etc already. People where violin is their first instrument usually take a bit longer to develop those because they won't have put in the work you already have. You have probably developed a bit better control over your left hand fingers than some, and it will be an advantage when you learn how to apply it. Since you've been playing guitar for 6 yrs, you probably have developed your ear enough that you can tell what notes you are playing and if it is in tune. That will help. However.. Then there's the bow. 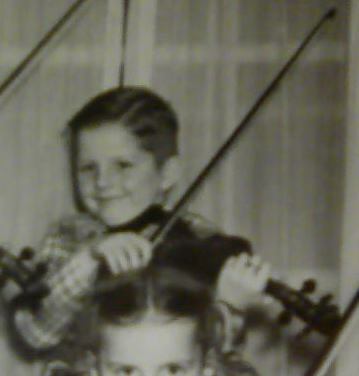 LOL I have found bowing to be the part of violin that has always taken the most work for me. At first it is a challenge just the use at all without being/feeling clumsy as heck, then getting it to go straight, and not make hideous noises, and eventually, to work on getting it to sound .. nice. There isn't really anything your right hand learned on guitar or etc that will prepare it much for that. But it is a worthwhile and fun challenge in it's way, because the bow allows an entirely different spectrum for expression than plucked or picked strings do. Stick with the instrument, put in your practice and learning time, and it will become less intimidating. Welcome, @knock , to the relative insanity that is this forum. Sounds like you will fit in real well ! I second everything said by other members above so I'll not add much more to their words. Enjoy the journey with an instrument which will I am sure become if not an actual obsession, at least a life-long friend. And post regularly ! Gonna try to hit everybody. @cdennyb 15-20 minutes? Wow! I just did a half hour practice (worked on my G major scale to get a feel, payed attention to bowing, and drilled the first half of a song I know for mandolin), and it was really effective. I was actually basing it off of the 35 day challenge, which has times as low as 30. Half the reason i got a mandolin was I wanted something fretless, and decided a different play style (bow) was in order, too. @Fiddlestix Had to look up David Garret, as I don't normally follow violinists who do covers, but that's impressive! I don't sound like any of my guitar idols, either, but I'm still playing guitar. @coolpinkone I already hit the G major scale with no problem today! (Fine, definitely some intonation issues, but it's better than yesterday). @DanielB I noticed it helped a bit, but I run into the same issue I have with singing where I know the note, but hit the wrong one by a half tone. It seems like simple practice should fix that up! I'm actually concerned that my bow may have a warp in it, but that's for a different thread, and some good ol' independent research before, so I'll worry about that if I keep having problems. I did find, oddly, that aside from trying to turn the bow while playing, it's not so bad as I thought. My right arm is sore up in the shoulder, though. @Bill I was a bit worried about intonation being perfect, and was actually going to look it up to see if it had to be pitch-perfect. It sort of reminds me of a mandolin joke, that seems to apply to violin: A player will spend half his play time tuning the mandolin, and the other half playing an out-of-tune mandolin. This place seems to be really laid back, which I enjoy more than anything. If the first couple days are telling, I may have a long future playing a violin. Thanks for responding everybody! You guys gave me a lot to consider, which when coupled with the practice I just finished (it was 30 minutes, scales, bowing, and a song I know for mandolin), all made the instrument seem less intimidating. @knock: Well, you may not want to hear this, but spending a little of your practice time on just ear training may be the easiest way to get more out of your time on the violin. Not that it is strictly for violin or singing. I took a course not too long ago, "Improve Your Musicianship" and I'd say almost half of it was ear training. Every quiz had questions with audio samples and "identify the interval" or "what chord is this" or "Is this a dominant 7th chord or a major 7th chord?" sort of stuff. You do have to live by your ear more on violin than any other instrument I can think of offhand. Well, you may not want to hear this, but spending a little of your practice time on just ear training may be the easiest way to get more out of your time on the violin. It's not news to me! It's actually part of why I got a violin, and part of why I started to practice singing with my guitar a while ago. I'll try the "find those notes" game tomorrow with one of my instruments and violin, see what I can do, it sounds pretty fun. Welcome to the forum knock. Hope you feel less intimidation soon. What I believe can help you feel less intimidation is to focus on progress. It's easy to focus on what doesn't sound good but if you can steer your focus towards improvements and perhaps even record yourself from time to time be better hear and see those improvements, you'll enjoy your journey even more. It's great that you play guitar and mandolin since they fit so many perfect fiddle genres to enhance the whole fiddling experience. Many here also play the guitar and are more than happy to give advice. Look forward to hearing more from you soon!